(Disclosure: I received the products featured below at no cost. All opinions are my own & no other compensation was received). I absolutely love displaying photo's around my home, a lot of walls in my home have family photos from over the years. It's nice to walk through my home & see pictures of my children, my parents, grandparents, brothers, etc. When I think about turning my family photo's into display photo's for my walls, my first stop is always Collage.com. Gallery-Wrapped Canvases are the perfect solution to brighten up any room, fill up the space on an empty wall or they make great gifts too! The canvases at Collage.com feature high-quality eight-color printing, a premium texture & a clear acrylic coating that provides a scratch-resistant protective layer with a satin luster. Each canvas is tightly wrapped without staples, backing & mounting hardware is already installed as well - allowing your canvas to be ready to hang right out of the box. You will find a variety of sizes at Collage.com, from 5x7 to 24x36 & more, you can even customize your canvas with background colors, shapes, effects & borders! Our Easter pictures this year turned out really nice & I had the perfect wall in our home to showcase them, so thanks to Collage.com I ordered a 16x20 & two 8x10's! I could not be happier with our new Gallery-Wrapped Canvases, they are beautiful, picture's don't do justice, these are stunning in person! I've always been impressed with the quality I receive from Collage.com, I know these canvases will last for many many years! So what do you think? 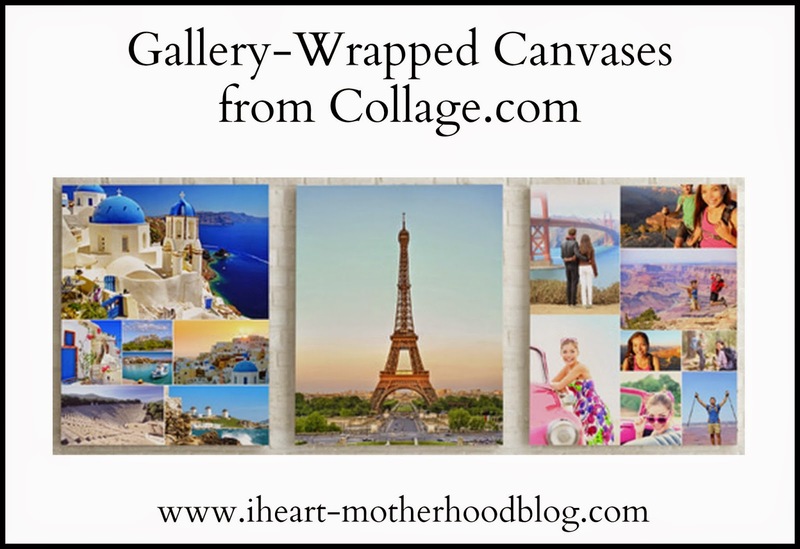 Do you enjoy displaying canvases through out your home? All you need to do is customize your book, then at check out, enter the code above & just pay for shipping! This offer is good for the first 1,000 people who claim it, and the code will expire on May 13. It's for U.S. readers only. Be sure to stay connected with Collage.com on Facebook & Twitter! Love these!! I definitely need to order a couple. I don't have any recent pictures of my kids up-- all are from a year ago and older. Thanks for the review! A canvas is perfect way to display family pictures, I really want one of there photo blankets for my mom. They certainly did a wonderful job with your photo. I do not yet have canvases, but this jut might make me change my mind.